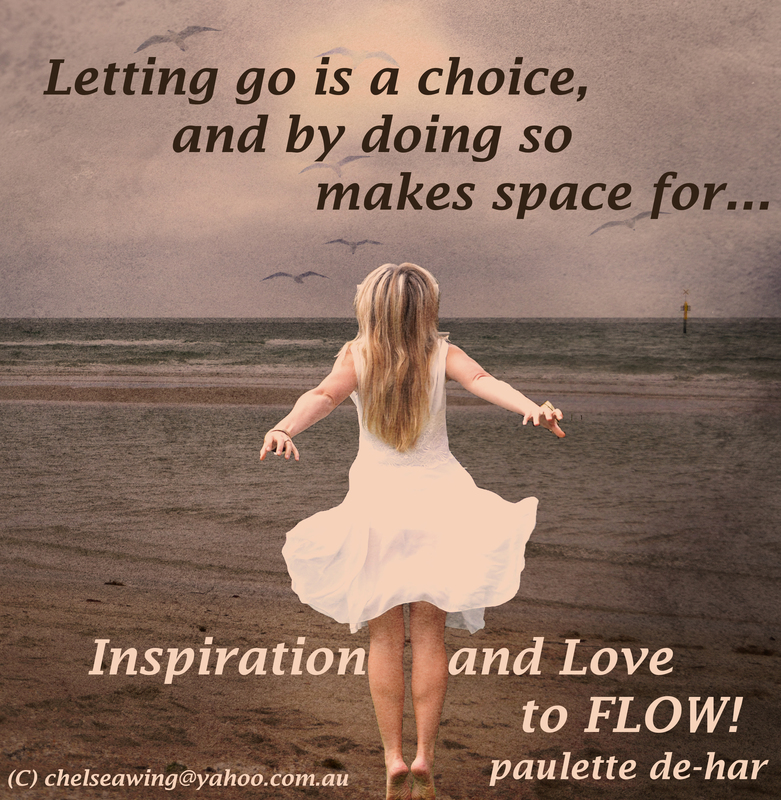 Letting go is not the same as giving up…. Or is it??? No, letting go is very different to giving up and you know they are different by how they feel. If we are letting go of something it usually implies moving from a resistant feeling place with negative emotion to a good feeling place with positive emotion. Whereas giving up on something usually implies moving from a resistant negative feeling place into more of a not good feeling place with stronger negative emotion. We can call it whatever we want, but it’s all about how it feels when we think about it. So truly letting go is the release of some resistant negative emotions or energy and should immediately bring us into a more positive better-feeling place. But letting go is not a one off occurrence in the sense that once you have released resistance, that’s it, you don’t need to do anything else. Letting go is like everything else in our life, the positive thoughts we have just allowed ourselves to experience must be maintained by giving them plenty of air time or attention within our thought process. This is very important, especially when changing negative beliefs or thoughts that have been held over long periods of time for they have become ingrained through receiving plenty of attention and focused thought, so even though we may temporarily let go of something and move to a better place, these thoughts also need to gain power and momentum through increased attention. If we do not make an effort to give our new positive thoughts attention, we often slip back into the old ways of thinking. It’s the same as a car that drives over a track many times, it’s often the first route we’re drawn to because we know it so well and it’s much easier than finding another way that requires more time and effort for us to take and may have unknown obstacles. And so it’s the same with our thoughts, when thinking about any subject we have pondered for some time, the thoughts we have the easiest access to are those that have had the most focused attention on them from us, for they have been responded to by the Law of Attraction in-kind and have far more power and momentum behind them. This is good news if our thoughts are positively focused and maintained until we feel strong positive emotion, as this is creating wanted experiences, but if our thoughts are negative, this is an indication that we are creating less than wanted circumstances so it’s a good idea to make an effort to gradually move ourselves to a better feeling place. It’s also good that as the old thoughts are thought less and less, just like our track, weeds will grow over them, and although it doesn’t go away, like anything, through lack of use, it becomes non-attracting once the new thoughts or beliefs have become our new dominant vibrational place on this subject. Once this has happened, our new improved thoughts become the new “general or normal” vibrational place, meaning, because we made the effort over time to bring ourselves into a better vibrational place that the Law of Attraction responded to in-kind as it does to all thoughts we have, now when we bring this subject into our mind, we will automatically have access to our improved thoughts. This is now our normal place! So it would be true to say no matter what we’ve thought in the past, whether it be positive or negative, we don’t need to keep giving our focused thoughts and attention to them, but it does take some time and effort to change them, because remember, the old thoughts may have a bit of momentum behind them, but as we become more aware and sensitive to how we’re feeling and we start seeing the correlation between what we are thinking and feeling (vibrating) and what’s turning up in our lives, we do start making an effort to change and improve our thoughts. Why is it important to know where we are? To go anywhere you need to have a starting point, and that starting point needs to be true and accurate, that’s all. Finding out where we really are vibrationally is not about judging one’s self negatively or making ourselves feel bad, it’s purely about finding out where our true starting place is so we can move in the best way possible to where we want to be. At the deepest level of who we really are, we know it’s possible to move into whatever it is we’re wanting, but we do have to start listening to what our emotions are telling us and to do our best to move into better feeling places. When we start to believe we can make it where we’re wanting to go, our experience starts reflecting back to us the manifestational evidence of our improved thoughts and feelings (vibration)… And how good is that!! Previous Article The goal is to love everything….Or is it??? Next Article Feeling better….Or in denial?? ?